Note: This is NOT the method described in The Incredible Feats of Jason Michaels . This is a new method that appears in print for the first time. This new information does not appear in print anywhere else. This is a novel and unique effect your spectators have not seen before! Back in the 80s Uri Geller did a similar effect and got a lot of publicity for doing this. 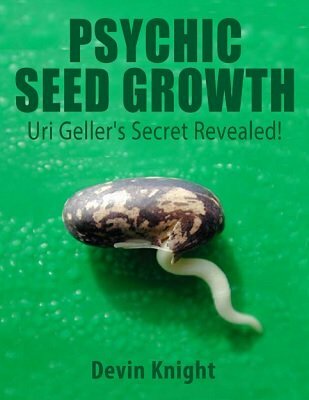 However, the Geller effect involved a switch of the bean seeds, and the spectator could not feel the energy that is possible with this improved effect. EFFECT: The performer shows a small clear Ziploc bag of bean seeds. The seeds are ungimmicked and can be examined by the spectator. The spectator reaches inside the bag and removes a handful of seeds. The spectator opens his hand and the performer picks up one seed and shows it to be nothing but a bean seed. The performer strokes the seed with one of his fingertips of the other hand. The spectator puts the other seeds back into the bag. The performer puts the single seed into the spectator's hand and has the spectator close his hand around the seed to create darkness and warmth. The performer shows his hands to be empty and moves them around the spectator's closed hand claiming he will send rays of psychic energy to the seed. The spectator actually feels these rays around his hand! When the spectator opens his hand, he finds that the bean seed has sprouted and can be examined and he can keep it as a souvenir. Here is a new and novel close up effect that gets away from cards or coins. It is very easy to do and the performer is completely clean at the end. Suitable for magicians or psychics. This is one of Devin Knight's favorite summer tricks. There are famer's markets in almost every city. Devin goes up to a booth where they are selling seeds. He reaches into a bin of beans and picks up one asking the farmer if these seeds are easy to sprout. He places the bean into the farmer's hand and has him make a fist around the bean. The farmer holds his closed fist upward. Devin sends psychic energy toward the fist; amazingly the farmer feels this energy. When the farmer opens his hand, the bean has sprouted. Be assured the farmer will show the bean to everyone that comes around talking about your strange powers. This makes for a great publicity stunt. Again, there are no switches of the bean. Just pick up one and give it to the farmer. So easy to do you will amaze yourself. PDF explains everything you need to know. A new novel secret revealed for the first time.